Our OCS Series provides a range of options for serving accounts large and small. From 23.25″ wide for those smaller areas, to 49″ wide for lots of equipment, all of our stands have double-wall construction for strength and durability. Browse this page and also look at our carts to find the best choice for your needs. Most of our stock items are available to ship within 24 hours. Many of our stands and carts are used by a number of coffee vendors to facilitate their growing coffee business. 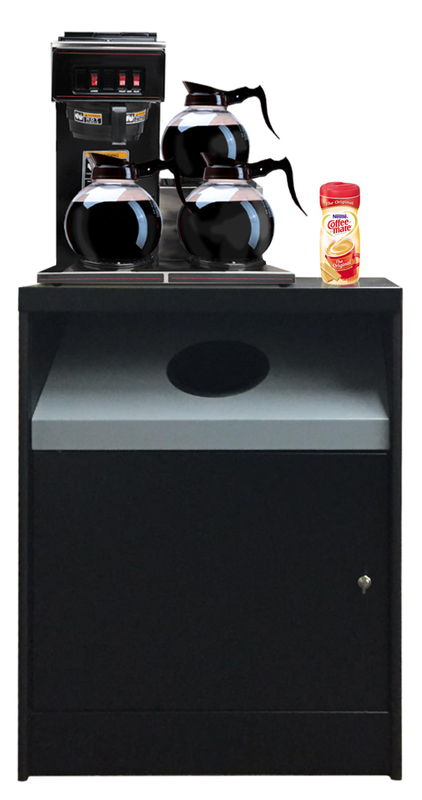 PLEASE NOTE – All of our coffee stands are now available with heavy-duty 2 inch casters. Once again we have done our best to keep the cost of this option low. WOW, each caster is rated for 150 pounds! Call one of great distributors for more information about this option. OCS 200 is our most popular size. It is a great choice for any office or break room. This unit is with a shelf, but you can get it without a shelf and save a little. It is perfect for that office coffee brewer or a microwave. Don’t forget all the lockable storage down below. Specifications: Top 23.25″ wide x 19″ deep x 32″ high. Cabinet 23.25″ wide x 17.5″ deep x 32 high, with shelf and condiment tray. Available Options: No shelf, cup dispenser. 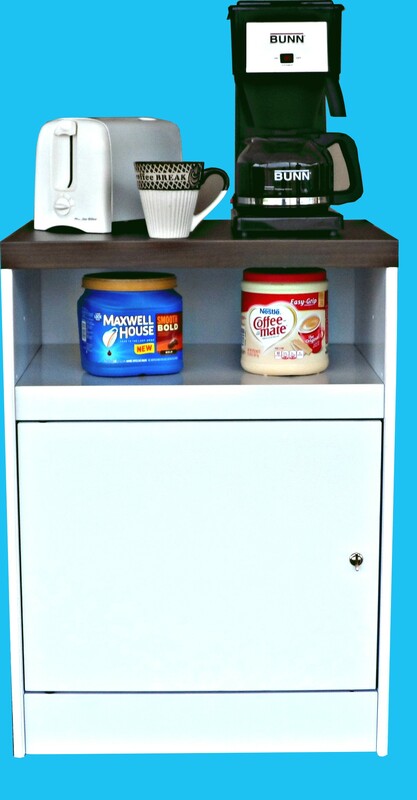 OCS 200-2-SW full-size home or office white kitchen stand with built-in bread shelf. This handy stand is suitable for the home or office. The all steel double-wall constructed unit means many years of dependable use. It is packaged to ship UPS to save you money. This stand comes with a walnut or oak vinyl clad steel top and will look great anywhere. Ask about free footies. Specifications: Top 23.25″ wide x 19″ deep x 32″ high. Cabinet 23.25″ wide x 17.5″ deep x 32 high, with 7″ shelf for quick access storage. 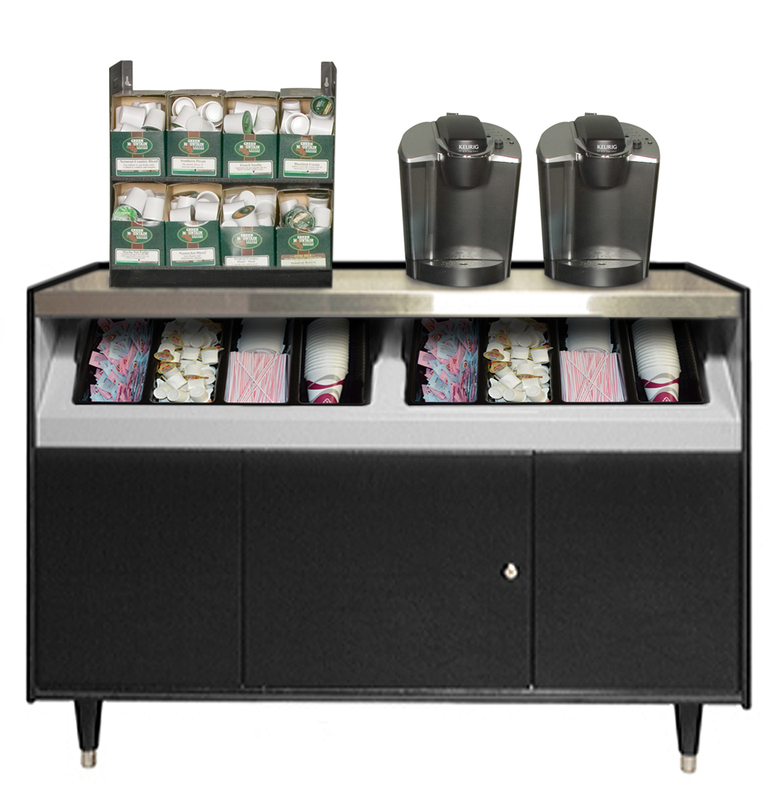 OCS 200-TR-SF is a full size coffee stand with a trash hole and room in the cabinet for your waste basket. Keep those pesky used condiment packets and stir straws under control. Specifications: Top 23.25″ wide x 19″ deep x 32″ high. Cabinet 23.25″ wide x 17.5″ deep x 32 high, with 6 inch trash ring. OCS 200 TR-CD-SF full size coffee stand with a trash hole and a cup dispenser. The deluxe cup dispenser provided has inserts to dispense cups from 3 1/2 to 44 ounces. Specifications: Top 23.25″ wide x 19″ deep x 32″ high. 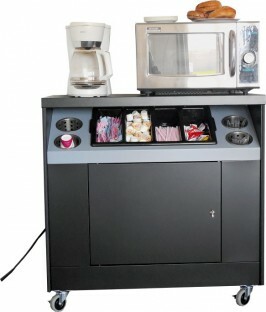 Cabinet 23.25″ wide x 17.5″ deep x 32 high, with 6 inch trash ring and a deluxe cup dispenser. Specifications: Top 35″ wide x 19.5″ deep x 32″ high. Cabinet 23.25″ wide x 17.5″ deep x 32 high, with shelf. Specifications: Top 36.25″ wide x 19″ deep x 32″ high. Cabinet 36.25 wide x 17.5″ deep x 32″ high, with 4 cylindrical condiment cups and condiment tray. 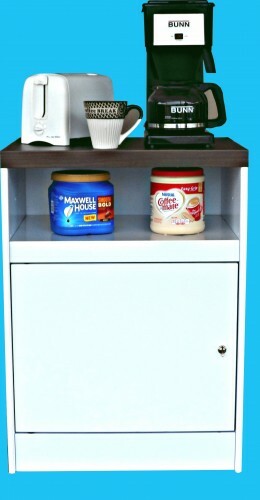 NOTE: The side cup dispenser shown in this picture is an add on item and is not included with this stand. Includes hole and waste area to accommodate modern single-serve coffee brewers. Designed to be used with today’s single cup units and their merchandisers.Specifications: 49″ wide x 23.25″ deep x 34″ high with two condiment trays. 1/2 inch top lip to help keep brewers in place. 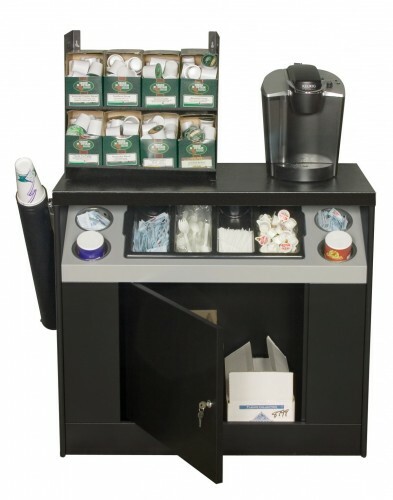 OCS490-5CD 5 quality cup dispensers plus stainless steel top. Our cup dispenser unit. This unit was developed for those high traffic areas. Whether you are dispensing juice, coffee, or soda, our new OCS490-5CD will allow you to keep the traffic moving. 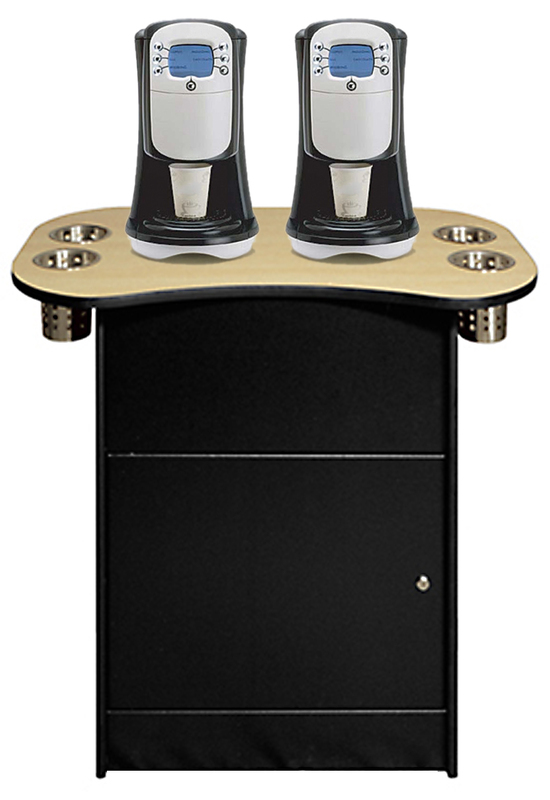 With our double-wall steel construction and stainless steel top this handsome unit will support those larger dispensing machines. Competitively priced, check it out, call a distributor today. OCC 36-ET On wheels with electrical receptacles. The most convenient coffee cart you will find anywhere. Plug in the coffee maker, plug in the microwave oven, and roll it on handsome heavy duty locking swivel casters to where it fits best. The stand itself will plug into the wall utilizing a built in 10 foot power cord. This corporate tool has it all. Four stainless steel utensil/condiment cups and a four part condiment tray makes this unit ideal and complete. Top 36.25″ wide x 19″ deep x 36″ high. Cabinet 36.25 wide x 17.5″ deep x 36″ high. OCS 271 Built for ice or juice machines. 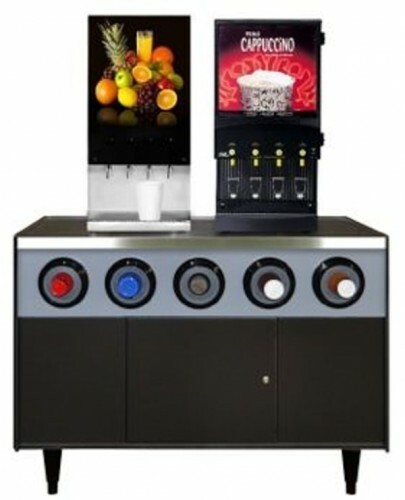 The OCS 271 will accommodate up to three cup dispensers. It has an access hole for those water and syrup lines. This unit makes a convenient an versatile companion for the counter-top machines. Think popcorn machine. Cabinet is 72″ tall, 27″ wide. The shelf is 25.5″ wide, 23″ deep, 27″ height.